William Edward Lori was born in Louisville, KY, in 1951. Following studies at Mount Saint Mary’s Seminary in Emmitsburg, Maryland, he was ordained a priest of the Archdiocese of Washington by William Cardinal Baum May 6, 1977. He would later serve as Secretary to James Cardinal Hickey as well as Chancellor, Moderator of the Curia, and Vicar General. 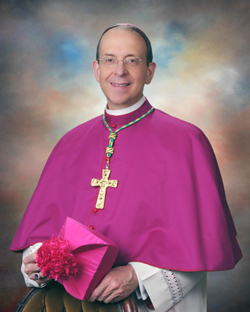 In 1995, Archbishop Lori was ordained Auxiliary Bishop of Washington, a position he held until March 2001, when he was appointed Bishop of Bridgeport, Connecticut. In recognition of his role as an emerging leader on the Church’s response to the sexual misconduct crisis, Archbishop Lori was appointed to the USCCB Ad Hoc Committee on Sexual Abuse and was instrumental in drafting the landmark Charter for the Protection of Children and Young People. In 2005, he was elected Supreme Chaplain of the Knights of Columbus, a position he continues to hold. On September 29 2011, Archbishop Lori was appointed Chair of the newly formed Ad Hoc Committee for Religious Liberty to address growing concerns over the erosion of freedom of religion in America. The Most Reverend William Edward Lori, S.T.D., was installed as the Sixteenth Archbishop of Baltimore on May 16, 2012. Kevin Davis was confirmed as Police Commissioner of the Baltimore Police Department on October 19, 2015 after having served as the Interim Police Commissioner and Deputy Commissioner of the Investigations & Intelligence Bureau. 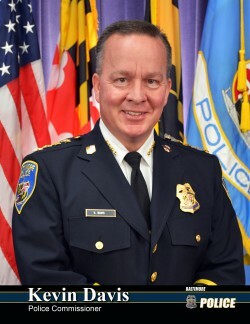 Prior to coming to Baltimore, Commissioner Davis served as the Chief of the Anne Arundel County Police Department, and retired as the second-in-command of the Prince George’s County Police Department after 21 years of service. A fourth generation public safety professional, Commissioner Davis is the son of a retired Prince George’s County police officer, and grandson and great-grandson to Washington, D.C. fire fighters. He is one of two living persons to be awarded the Key to the City of College Park, home to the University of Maryland. 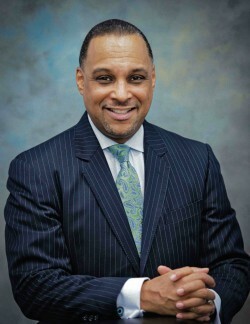 Commissioner Davis graduated from DeMatha Catholic High School, earned his bachelor’s degree in English from Towson University, and received his master’s degree in management from Johns Hopkins University. He is a graduate of the FBI National Academy and FBI National Executive Institute, and is a regularly featured speaker at the FBI National Academy and International Association of Chiefs of Police training events. Commissioner Davis and his wife, Lisa, raise four children. Senior Pastor of the Douglas Memorial Community Church in Baltimore, Maryland; Chief Executive Officer of Camp Farthest Out, Inc. and Douglas Village, Inc.
Dr. Sheridan Todd Yeary is the Senior Pastor of the Douglas Memorial Community Church in Baltimore, Maryland. He also serves as the Chief Executive Officer of DMCC's two community development corporations - Camp Farthest Out, Inc. and Douglas Village, Inc. Dr. Yeary is the former Associate Director of the Center for Black Studies at Northern Illinois University in DeKalb, Illinois. A third-generation preacher/pastor, Dr. Yeary serves the faith community of Douglas Memorial as the fifth pastor in its 90-year history. Dr. Yeary is often sought after to offer commentary, public testimony, and insight on a variety of public policy and leadership concerns, and has presented in a variety of forums, including the Faith Leaders Round Table at the Congressional Black Caucus (2011, 2012), the Martin Luther King, Jr. Lecture Series on Racial Reconciliation at Hamline University (2003-2004), the Brown v. Board of Education Summit at College of DuPage (2005), and the African American Family Summit at the University of Nebraska at Lincoln (2002-2006). Dr. Yeary’s presentation on the role of religion in promoting diversity at the spring 2006 convening of the Oxford Roundtable at the University of Oxford in England was later published in the Oxford Round Table’s Forum on Public Policy journal. Currently, Dr. Yeary holds an adjunct faculty appointment in the College of Public Affairs at the University of Baltimore, teaching courses that explore faith and public policy and the legal construction of race. Dr. Yeary holds a Bachelor’s Degree in Management from National-Louis University, a Master of Divinity Degree from Garrett-Evangelical Theological Seminary, the Graduate Certificate in African Studies from Northwestern University, and the Doctor of Philosophy Degree (Ph.D.) in the area of Religion in Society and Personality from Northwestern. Dr. Yeary is a member of the 2012 class of the Board of Preachers of the Martin Luther King, Jr. College of Preachers and Laity of Morehouse College. Dr. Yeary’s travels and research are centered in Ghana, West Africa, focusing on the relationship between traditional African values and the African American experience. Dr. Yeary’s interests include mentoring youth and young adults, community activism, urban public policy and the development of processes of productive transformation that liberates all people. Currently, he serves on the boards of the Center for School Mental Health and Behavioral Health System Baltimore, and the Advisory Board to the College of Public Affairs at the University of Baltimore. Dr. Yeary is a member of the Ministerium of the International Council of Community Churches and currently serves as the international liaison between the Council and constituent churches in Ghana, West Africa. Additionally, Dr. Yeary was recently appointed to the board of trustees of Baltimore City Community College by Governor Martin O’Malley. As part of his community activism, Dr. Yeary serves as the Political Action Chair of the Maryland State Conference NAACP, on the national Religious Affairs Committee of the NAACP, and is a principal with Community Churches for Community Development. Dr. Yeary is currently writing two books - The Black Church and HIV/Aids, and Protecting Blackness: Faith, Pilgrimage and the Resilience of the African American Self. He is married to the Rev. Rhonda S. Boozer-Yeary, and they are the proud parents of four children - Robert Aaron, Simone Kathlene, Jordan Amani, and Joshua Asante. Dr. Byron Johnson is Distinguished Professor of the Social Sciences at Baylor University. 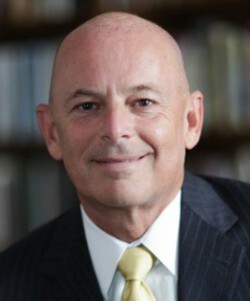 He is the founding director of the Baylor Institute for Studies of Religion (ISR). He is a Faculty Scholar in the Center for Spirituality, Theology, and Health at Duke University, Senior Advisor in the Religious Freedom Research Project at Georgetown University, Senior Fellow with the Witherspoon Institute (Princeton), Senior Fellow at the Sagamore Institute (Indianapolis), and is a Senior Advisor at the Religious Freedom Institute (Washington, DC). Before joining the faculty at Baylor University, Dr. Johnson directed research centers at Vanderbilt University and the University of Pennsylvania. Dr. Johnson is a former member of the Coordinating Council for Juvenile Justice and Delinquency Prevention (Presidential Appointment). Dr. Johnson has recently published a number of articles on the role of faith and service in helping addicts remain sober. He is recognized as a leading authority on the scientific study of religion, the efficacy of faith-based organizations, and criminal justice. Recent publications have examined the impact of faith-based programs on offender treatment, recidivism reduction and prisoner reentry and is the subject of his book, More God, Less Crime (2011). Dr. Johnson also directs the Program on Prosocial Behavior, which examines the ways in which religion impacts key behaviors like volunteerism, generosity, and purpose. His most recent book, The Angola Prison Seminary (2016), assesses the influence of a Bible College and inmate-led congregations in the identity transformation of inmates serving life in a maximum security prison. His new book The Quest for Purpose, will be released summer 2017. He is working with the Gallup Organization to design empirical studies exploring religion and spirituality in the world. Dr. Johnson was the 2013 Lone Star Big Brother of the year for Big Brothers Big Sisters of Texas.